As the second largest city in, and capital of, Scotland, Edinburgh has plenty of opportunities for the hog roast devotee to indulge. Like anywhere else it has plenty of pubs, always great places for us at Hog Roast Edinburgh to cater for. Whether it’s to go with sport, a beer festival, or a private party, it’s fantastic to see people gathering together for an event. The hog roast just adds to the sense of occasion, as our glass-fronted machines allow our customers to glance in from time to time and see how the roast is doing. The anticipation can only build over the several hours it takes for a roast to cook, watching the meat become tender and the crackling crisp up. And of course there’s the smell, which fills the air so that long before the meat is done everyone’s ready to eat it! Once it’s cooked our chefs carve the meat, adding to the spectacle. There’s nothing like seeing the skilful carving of a whole pig. Our staff load up soft floured rolls with warm meat, apple sauce, sage and onion stuffing, for a sandwich that’s just amazing if we do like to say so ourselves! At Hog Roast Edinburgh, however, we cater for more than just pubs. Edinburgh has plenty of events throughout the year, which sometimes calls for a different approach to feeding a crowd. There is, of course, the Edinburgh Festival, which is actually a group of lots of different festivals taking place over four weeks. Apparently the people who visit for the festivals effectively double the population of the city! As part of the overall festival there is, of course, the Edinburgh Fringe, which is the largest performing-arts festival in the world. There is also an International Festival (more performing arts, as well as exhibitions, talks, and workshops), the Edinburgh Military Tattoo, and an International Book Festival. Other events throughout the year include the Hogmanay street party and the Beltane Fire Festival. Hogs at Hogmanay, anyone? 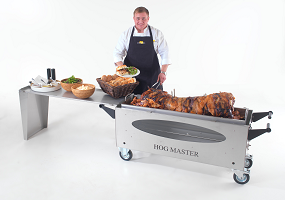 No matter what the event, at Hog Roast Edinburgh we always do our best to meet our customers’ requirements. Whether it’s a feed ’em quick barbecue, with our amazing sandwiches handed out with napkins and paper plates, or a full buffet, there are plenty of options to choose from. You can change the meat choice, or have a variety of sides and salads. A hog roast is even a popular choice at weddings, since we can offer it as an evening snack, or as part of the official reception dinner. As well as a chef, the formal meal option comes with a choice of canapés, as well as starters and desserts (although you do have to bring the cake). Whether it’s birthdays, weddings, anniversaries, and festivals, the reasons for having a hog roast keep coming all year round. In such a lively city, there are always plenty of people looking for something a bit different when it comes to entertaining. At Hog Roast Edinburgh, we provide just that.